If you’ve been searching for a “Toyota dealer near me,” come to Peoria Toyota to view our Toyota models for sale. Our Toyota dealership in Peoria, IL, has been locally owned for over 40 years and offers friendly Toyota sales, service and financing. As your nearby Toyota dealer, we feel it’s our duty to help you buy or service a Toyota in a low-pressure sales environment. That’s why when you lease a Toyota with us, you’ll feel confident that you got a great price on a new or used Toyota. 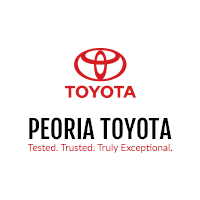 Get directions to Peoria Toyota and see how easy it is to get to our Toyota dealership nearby! Want to buy or lease a Toyota? Come to Peoria Toyota! Our new Toyota inventory is stocked with new Toyota cars, trucks and SUVs that are perfect for Central Illinois drivers. You can lease a new Toyota Highlander SUV or finance a new Toyota Camry sedan. Shopping on a budget? Browse our used cars for sale and buy a used Toyota RAV4 or pre-owned Toyota Tacoma truck. Our pre-owned cars are priced according to their current market value, so come see how our Internet Market Value Pricing can help you save on a used Toyota Sienna minivan. Buy a used car under $10,000 in Peoria, IL! Apply for auto financing at our Toyota finance center to secure a car lease or loan. Our Toyota finance center works with Illinois drivers who have good, poor or no credit, because we want everyone to be able to lease or finance a Toyota. You can speak with our Toyota financing experts to learn the difference between buying vs. leasing a Toyota and discuss your Toyota end-of-lease options. We’re here to help you qualify for a subprime auto loan or help you save on a new Toyota with outstanding Toyota lease specials and Toyota finance offers. The Peoria Toyota team can even help you trade in and trade up to a new Toyota. Just visit us to find out how much your car is worth and get a competitive Edmunds trade-in value. Need Toyota maintenance and repairs fast? Visit the Toyota Express Maintenance lane at our Toyota service center in Peoria, IL! Our no-appointment-needed service lane provides speedy Toyota oil changes, tire rotations and brake inspections whenever it’s most convenient for you. We make a point to post the Peoria Toyota service menu online, because we want you to know how much your Toyota wheel alignment or battery replacement will cost. If you’re worried about the price, know that our Toyota service specials and Toyota parts coupons are here to help you save. Schedule Toyota service or order OEM Toyota parts! Peoria Toyota is your nearby Toyota dealer. Contact us today to see why we’re Tested. Trusted. Truly Exceptional.